In 1985, Eric Chu started out in the animation business as a storyboard artist. A few years later, he moved to Asia and co-founded Fisheye Films where he acted as Creative Director for television commercials. Upon returning to Canada, Eric found work in Vancouver BC as Art Director. He recently produced a short film featuring Optimus Prime, which has attracted the interest of Hasbro and Tom DeSanto, producer of the upcoming Transformers movie. 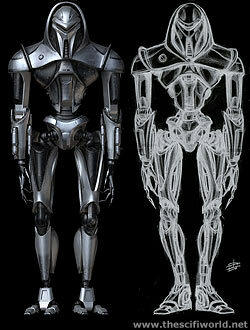 But he is more known for his work as concept art designer on the cylons from the new Battlestar Galactica series. 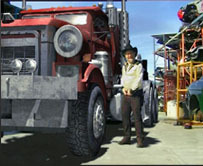 Gilles Nuytens: What is your artistic background, your studies, how did you begin to draw and to work with CGI? Eric Chu: I first started out by studying animation at the Emily Carr College of Art in Vancouver, BC back in '82. You have to remember that this was before computer animation had really taken off, so everything was still done by hand. It was not a popular profession to be in. The industry was very quiet and even Disney was in a slump, so at the time, there really was no other outlet for someone who spent his time drawing spaceships and robots. In retrospect, it was a good thing in that going to art school forced me to focus on a more classical art training. However, animation proved to be too time-consuming for me, and, after a profoundly formative period which comprised of two years' exposure to performance art, obtuse poetry and conceptual pieces, I had decided to move on, as I was unable to keep a straight face. 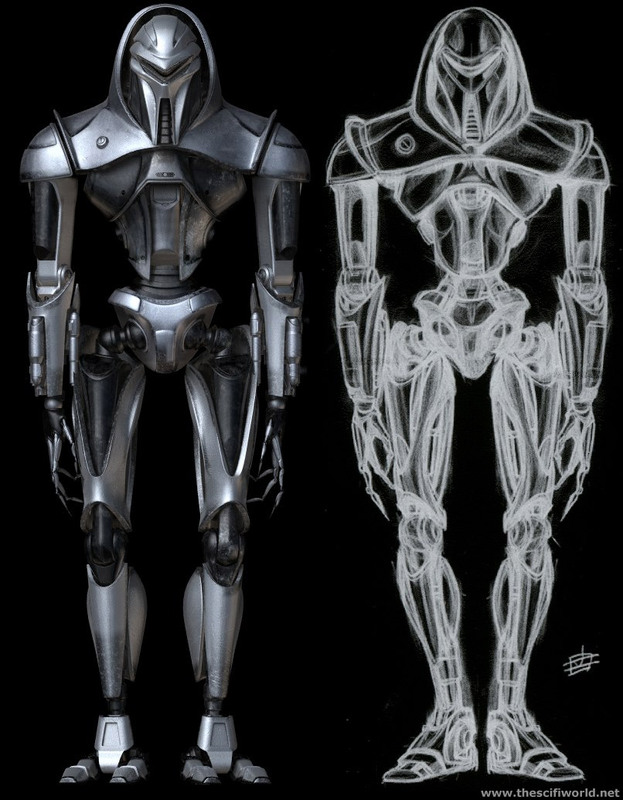 Shortly after, I found work at Nelvana Studios in Toronto where I worked on the Star Wars cartoon spinoff, Droids. At the time it was a great training ground, but the longer I continued in animation, the more I felt dissatisfied with the North American industry. Everything had the same homogenous feel to it. In addition, there was resistance to move beyond anything that was other than the children's market. Previously, adult animation had a history of failing miserably (for instance, any of Ralph Bakshi's films, Heavy Metal, and even Nelvana's own Rock & Rule), but personally I don't believe it is a matter of a lack of market, it's just that these films were, to put it simply, bad. Then Japanese animation became popular. Suddenly we were presented with complex and adult storylines and the growing popularity showed that there was indeed a market for adult animated films. However, changing the North American animation industry is like diverting an aircraft carrier with a garden hose, and it became increasingly more frustrating to stay in the business. In the early mid 90's I decided I had had enough and decided to shake my life up by moving to Asia, where I found work in live-action movies. The job wasn't much more than "Boom Operator" (holding a microphone to the actors for sound recording), but it got me on set and I was able to learn the basics of live filmmaking. I eventually partnered up with a local director and formed Fisheye Films, where we produced several commercials. It still exists to this day, and I occasionally go back to work on the odd project. I had always loved both animation and live action, and now, having gotten hands-on training in both, I began to look for ways to combine the two. At this point CG popularity was in full swing, but I was still hesitant to make the jump simply because it was still a very technical process and I had still not managed to figure out how to get email on a computer. I could certainly see the potential of such a powerful tool, but it still needed to be more user-friendly before I could attempt getting my head around it. Upon returning to Canada, I found myself back in the animation business, but to me, it felt like a step backwards and I could not remain in it for long. Eventually I found work doing conceptual art for some local productions here which led, eventually, to Battlestar Galactica. My work on Galactica has been my entry point by which I was able to satisfy my passion for both animation and live action. It was intensely satisfying to see something that I pulled out of my imagination made into reality (via CG). At this point, my team and I have a couple of CG animated projects in the works, but I don't see myself devoting the future solely to CG. There are many techniques out there to be tried, and I am game to try all of them. 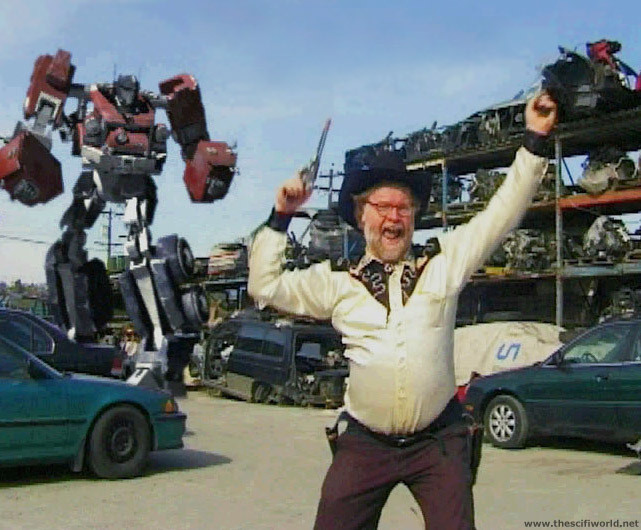 Gilles Nuytens: I read somewhere that the producers of the upcoming Transformers movie were interested by the short movie you did with Optimus Prime. Can you speak about that? Will you be involved in that project? Eric Chu: Early last year we found ourselves with some time on our hands, so we produced a little test to see what we could do on what limited resources we had at the time. So, with a video camera in hand, a bit of elbow grease, we set out to do a short film. Not counting the hardware, software and labor, we only ended up using about $200, mostly for costumes and a homemade green screen (paint and plywood). 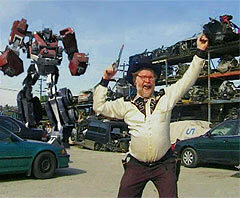 When it was all finished, we showed it to Tom DeSanto, who was producing the Transformers movie. He then passed it off to Hasbro, who got a kick out of it. Currently, Dreamworks seems to have their own take on Transformers, and it being such a big-budget extravaganza, I believe they have their own team working on it. I'd love to do it, though. Disclaimer: Please, do not direct link to this files, link to the page ONLY. Gilles Nuytens: Did you ever make drafts, projects or is there any debate about showing the homeworld of the Cylons in the future? If not, How would you imagine it? Eric Chu: The script for the mini-series did not make any reference to a "homeworld" so none was ever designed. However if I were to speculate, I would probably want to steer clear of the metallic planet cliche. It really makes no sense. In fact, my reasoning would be that since the Cylons were created by the humans, wouldn't the Colony planets be their homes too? When the Cylons left, it would be analogous to children leaving home to wander until they were able to return to their birthplace again. 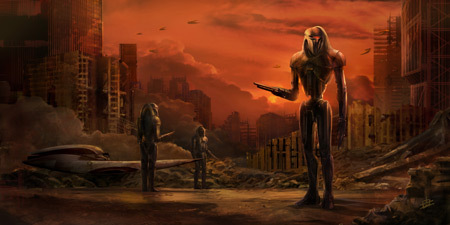 So, in a sense, I believe that the Cylons also became a rag-tag fugitive fleet of their own. Gilles Nuytens: In the original show from 1978, there's a ship called "The ship of Light" if I remember well, it was in the double episode "War Of The Gods", is there a plan to redesign this ship for the new show? Eric Chu: If I remember correctly, the "ship of lights" was part of Larson's Mormon theme for the original series. In my opinion, it would not fit very well in the new show as such a literal representation of angels would be kind of hokey. Gilles Nuytens: What is your opinion on the sequel to the original series, Galactica 1980? Eric Chu: My first brush with Battlestar Galactica was shortly after the release of Star Wars. All of a sudden science fiction was hot and we couldn't get enough of it. The theaters were flooded with tons of poorly-made crap just to cash in on Star War's success. Well, in Canada, Battlestar Galactica was released theatrically and we all thought it was the next big-budget science fiction blockbuster. I remember sitting in the theater sucked into a world of evil robots, beautiful women, bizarre aliens and hotshot pilots. It had that cinematic look, great special effects, and high production values that was missing from the then-current crop of cheapo movies. When it later showed up as a series, it was probably the best-looking show on TV. In fact, it was quite literally a weekly theatrical movie. I mean, we can all look back at it now and fault it for its cheesiness, but at that time, there was nothing else like it. However, as time went on, the show became more and more watered down and by the time its run had ended with Galactica 1980, it had become a bit of an embarrassment. My feelings for the show had changed, and when it was cancelled, I really didn't miss it. So fast-forward to December of 2002, I received a call from FX Supervisor Gary Hutzel, with whom I had worked with on a previous production. He sent me the script and I read it over in one sitting. This wasn't the Battlestar Galactica I had grown up with, not by a long shot... this was grim and realistic! Gilles Nuytens: What is your method to get ideas? Making drafts, drafts and drafts until you get the idea or looking around the web, comic books, illustration books or else until you have what I call a "flash"? Eric Chu: It really is a difficult thing to put your finger on what inspires you. Ideas can come from anywhere, and when you least expect it. Depending on the subject matter, yes, I will do a bit of research because the more elements you can draw from real life, the more believable your work will be. The more you understand your subject matter, the more you will be able to intelligently manipulate it. When it comes to the actual drawing, I generally let my pencil roam on the page. This is simply a way of getting something down on paper, even if it isn't recognizable at first. When I see a shape that I like emerge, I will strengthen the lines and expand on it. At this point I am only exploring curves, sizes and proportions, and nothing here is ever meant to be seen by anybody else. If I screw up, I just erase or go to another area of the page and start again. Once I have a basic shape I find interesting, it is blown up to the size of the final drawing and then I trace the lines I like onto marker paper, ink it, and shade it. The drawing is then scanned into the computer and I clean up any mistakes with Photoshop and add any final polishes. Gilles Nuytens: How much time did you take to create the cylon centurion, approximately, from your first idea to the final version? 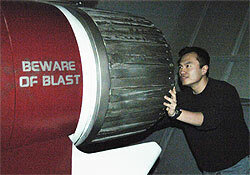 Eric Chu: Many of the designs for Galactica were done in parrallel. That is, at some point or another during the two month period, we were working on all the designs at once. The Centurion began early, but in the end, it was one of the last ones finished simply because it was difficult to get an idea of what the producers were after. It was always the intention, though, to find a design that would emphasize the Cylon's mechanical nature and that this design could not possibly be a "man in an suit". After many unsuccessful tries, Gary Hutzel finally sent us a quick sketch of a mechanical version of the Angel of Death, complete with a "hood". Seeing that we were not necessarily bound so close to the original design, I took his drawing and expanded on it. It was approved almost immediately. Gilles Nuytens: Outside of Galactica, on what else are you working for the moment? Eric Chu: Unfortunately, I am not working on Galactica at the moment. On the mini, Richard Hudolin's art department had so many props and locations to design that the task of designing the ships and the Cylons fell to the FX department, where I was brought in. However, now that most of the show is already designed, the art department has taken over all the design duties of which, I'm sad to say, I am not a part of. Currently I have opened up my own studio, PARANOID DELUSIONS INC, and am focusing my efforts on producing films. 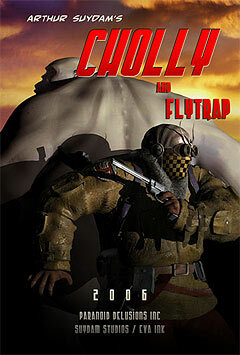 At the moment, we are working on an animated pilot based on Arthur Suydam's Cholly and Flytrap series of graphic adventures. Gilles Nuytens: What do you prefer, to draw or to work with CGI? And why? Eric Chu: I don't necessarily prefer one over the other, as both are valid tools to be used towards a final end product. I do not use one method exclusively and often make use of both in the same illustration. However, I do find that there is a danger in relying solely on the computer's capabilities, and I do like to step back and do things the "old school" way from time to time. Computers can make one lazy. Gilles Nuytens: What is your opinion on fan artworks in general, those who reproduce your ships for example? How do you feel about that? Eric Chu: I haven't seen very many yet even though the show has been around for a couple of years now. However, I do get a kick every time I see my designs used. Gilles Nuytens: Who are the artists whose you like the most the works? Eric Chu: In terms of illustration, there are many, many influences: Ron Cobb, Dean Cornwell, J.C. Leyendecker, Yasashi Nirasawa... but that list changes often. I take inspiration from all of them, but I do not try to emulate their style. I just do what I think looks best and suits the subject matter. In the end, the piece should reflect your sensibilities and not somebody else's. Gilles Nuytens: What advices could you give to young artists or beginners (on CGI, drawings, ...)? Eric Chu: In both cases I would stress a good classical drawing background. In this profession I have seen so many people come into our offices with a good CG portfolio, but nothing in the way of life drawing or painting skills. It is important for someone who is serious about being in the art business to realize that good drawing is a valuable and important skill, in many cases more so than merely a technical education in computers. Many students give up on drawing too easily because they feel it is too difficult, but it is precisely that quality that makes the effort worthwhile, and when I see a portfolio that has good sketching skills, that person stands out to me because it shows me that they have taken the time and effort to learn. It is not something that can be learned quickly, but as with any discipline, practice makes perfect. As Chuck Jones says, every person has a hundred thousand bad drawings in them and the sooner you get them out, the better. That's very true. The key is... DON'T GIVE UP. As I said earlier, computers have a way of making things too easy sometimes. There is great value in doing things the hard way. It forces you to look and analyze your subject. Most of the drawings I see from students tend to be copied from comic books or anime. Well, that's fine for a start, but there is only so much you can learn from another's drawings. The real skill is in interpreting the life around you into your work. Only then are you working from a true accurate source. The other bit of advice is to be open to as many things as possible. Try painting, sculpting, music, photography... it all helps you build valuable experience. And don't limit yourself to only art subjects, but a knowledge of world cultures, history, science, etc. will give you the necessary tools to produce richer images and stories, and will make you a well-rounded person also. Gilles Nuytens: If someone had to choose between learning Lightwave, 3DsMax, Maya or Cinema 4D, which one of these would you advise with and why? Eric Chu: Which application to use is purely a personal choice. Amazing works can be accomplished with any tool as long as you have a good artist behind it. A powerful program cannot save a person with bad artistic sense. My feeling is to find a tool that is intuitive to you. Some programs can be too technical and complicated, and if it is difficult to use, you probably won't use it. Gilles Nuytens: If you had to create another alien race for Galactica, not especially evolved, maybe animals or something else, how would you imagine it? Eric Chu: Love-starved alien women in go-go boots. Gilles Nuytens: What was the most hard and challenging design you had to do for Galactica? Eric Chu: That honor would have to go to the Cylon Raider, although the Centurion and the Galactica come it at close seconds. The Raider proved to be the most challenging because, in the original script, it was described as a "squashed Cylon".... well, how do you visualize something like that and keep a straight face? But no matter what we came up with, it always came back to those two words. Well, we knew we had to have a face on it, since the roving eye played an important part in the story, and the elongated fuselage was a holdover from an idea in the script that the Raider could jettison its wings and become a nuclear missile, and finally, with the wings, I tried to keep the basic disc shape of the original Raider. The design was then given to Zoic, where Charles Ratteray did a pass on it that introduced the now-familiar scimitar shape. In the end, I did a final pass just to incorporate more of the organic features already present in the Basestar. Gilles Nuytens: And last question, do you have an anecdote related to the show that you would like to share? Eric Chu: I wish I had a funny story to tell here, but I don't. However, I would like to say that I have been in the unique position of having witnessed the evolution of this show from behind the scenes and it is gratifying to see people's reaction to it. I have now been to the San Diego Comic Con several times during Galactica's production and the first time Sci Fi did a presentation on BSG, it was met with skepticism. I remember thinking to myself, "It's a good show but are we going to be lynched"? Then, last year I went again, and this time the entire auditorium gave a standing ovation! I am constantly amazed at how well the show turned out, because, at any step along the way, we could have made a wrong turn. I think that the credit should go to the cast and crew who worked under intense conditions to create something worthwhile. Budget constraints were tight and yet, nobody was willing to turn in a half-assed job. When I finally saw the mini-series, I was blown away. I literally had not been that excited by a show since the first time I saw Star Wars.